The 5.65 x 5.65" Color Graduated Plum 3 Filter from Formatt is one of the most widely used category of filters. It enhances reality, adding a touch of subtlety or drama to the image. 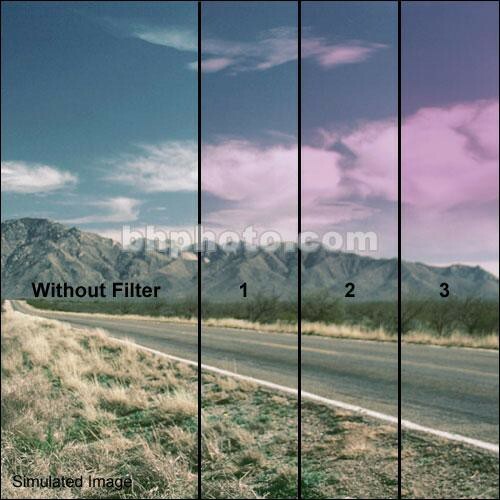 A Graduated Plum 3 filter is the most intense version of this filter. It differs from a Graduated Magenta that produces a milder purplish/red tint. Sometimes it is also desirable to add color to part of the photograph. For example, to add blue to only the sky. Formatt Color Graduated filters are half-color, half-clear, with a graduated transition for blending into the scene. They are available in an array of colors. Soft/hard indicates the degree of transition. Horizontal/vertical indicates the direction of the transition.